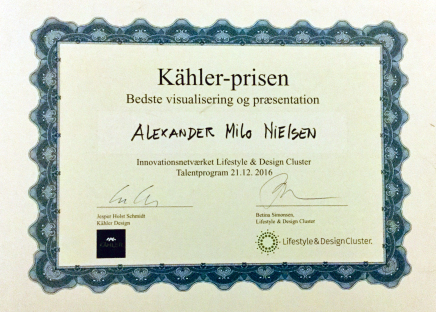 Four design talents were in December 2016 crowned as winners of a talent development program organized by the Innovation Network Lifestyle – Interior & Clothing. The goal was to provide matchmaking between Danish design schools talents and renowned Danish companies. 16 students were matched with five selected companies: Skovby Møbelfabrik, Kähler Design, Innovation Living, Eilersen, Paustian, and a group of four students from respectively Designschool Kolding, VIA Design, Aarhus School of Architecture and SDU. All collaborations have resulted in tangible opportunities for new products and concepts that come into production.